Ustad Allarakha Khan was born on April 29, 1919, at Phagwal village of Jammu, 80kms from Lahore. He was fascinated with the sound of tabla since the age of 12, when he was staying with his uncle at Gurdaspur. The determined young lad ran away from home and became a disciple of Mian Qader Baksh of the Punjab Gharana, who initiated him into the world of music. He learnt ‘Raag Vidya’ (the melody aspect) from Ustad Ashiq Ali Khan of Patiala Gharana. His regimen of practice and dedication were the stuff of legend: hours and hours of hard, disciplined practice cultivating his skills that would eventually pay off. He started his musical career as an accompanist in Lahore and then as an All India Radio staffer in Mumbai 1n 1940. Soon after he composed music for a couple of Hindi films from 1943-48. The venerable master later achieved world renown as Pandit Shankar’s chief accompanist during his apex in the 1960s, delighting audience in the West with his percussive wizardry, both as an uncanny with flawless timing and sensitivity as well as a soloist where he was a master of improvisation, a prolific composer and an electric showman. The Ustad popularized the art of tabla playing all over the globe, elevating the status and respect of his instrument. Abbaji (as he was affectionately known) also bridged the gap between Carnatic music and Hindustani music by performing with both renowned Carnatic musician as well as other Hindustani stalwarts. Ustad Allarakha’s three sons – Zakir Hussain, Fazal Qureshi and Taufiq Qureshi are all masters of percussion in their own right. He once said in an interview that when he played outside India, his aim was to teach the Western world about the beauty of Indian music. When asked to say a few words at his 80th birthday celebrations last year, he played the tabla instead. This is the language I know, “ he told the audience. Zakir Hussain, the eldest son and a disciple of Ustad Allarakha Khan, is a classical tabla virtuoso and the most famous tabla player in the world today. His contribution in the field of percussion and in the music world at large is highly appreciated. Ustad Zakir Hussain was born on March 9, 1951. Zakir Hussain was a prodigy and started touring by the age of twelve. He went to the United States in 1970 and started his international career. Zakir Hussain is widely considered as the chief architect of the contemporary world music movement. He founded many historic collaboration. These include : Shakti which he founded with John McLaughlin and L. Shankar, the Diga Rhythm Band, Making Music, Planet Drum with Mickey hart, and recordings and performances with a number of artists such as George Harrison, Joe Henderson, Van Morrison, Jack Bruce, Tito Puente, Pharoah Sanders, Billy Cobham, the Hong Kong Symphony and the new Orleans Symphony. In 1988, Zakir Hussain became the youngest percussionist to ever be awarded the title of “Padma Shri” by the Indian Government. In 1990 he was awarded the Indo-American Award in recognition for his outstanding cultural contribution to relation between the United States and India. In April, 1991, Zakir Hussain was presented with the Sangeet Natak Akademi Award by the President of India. Zakir Hussain is also the recipient of the 1999 National Heritage Fellowship, the United States most prestigious honor for a master in the traditional arts. Zakir Hussain has composed soundtracks for several movies ; notable among them are “In Custody” and “The Mystic Masseur” by Ismail Merchant. Zakir Hussain has Bernardo Bertolucci’s “Little Buddha”. In this special pack, we bring you a rare collection of the first family of the tabla, the great legend Allarakha in a Jugalbandi with his son maestro Fazal Qureshi; and internationally acclaimed star percussionist Ustad Zakir Hussain playing the Tabla in its purest form. 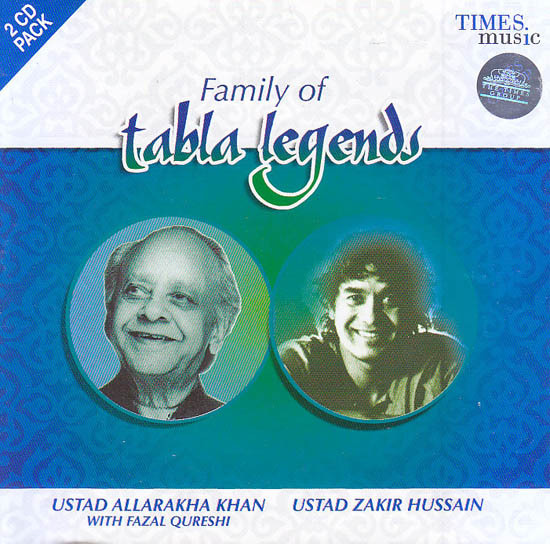 Fazal Qureshi, the second son of Ustad Allarakha is a tabla maestro in his own right. He has performed solo and also accompanied several music stalwarts all over the globe. His fusion band Mynta – Surya has been acclaimed the world over and is known for its unique sound.